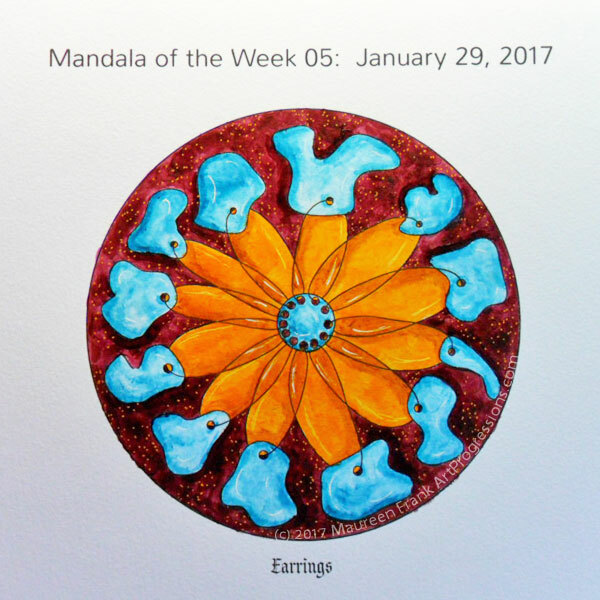 I knew in advance that I wanted to be somewhat true to the amazonite chips color as seen on the pair of earrings that inspired this mandala design. The rest of it (the background and “petals”) I figured out as I went along. As it turns out I ended up using new-to-me colors that wanted to come out to play. How could I turn them down? I love the color mix and balance of warmth (maroon and indian yellow) and coolness (turquoise). For this painting, I used a mix of Golden Matte Medium with M. Graham and Golden acrylics on canson’s mixed media paper; plus a couple of gel pens (white, yellow, salmon) for highlights and dots.